each item 2 fl.oz./ 60 ml. A couple of years ago I did reviews on Brevena products and how much I liked them. Brevena sent me this Perfect Pair set to review and I must say, their products have gotten better with time. They pride themselves on their Macroβ Complex, with begins with oat beta glucan, a powerful botanical element found in the cell wall of oats. Through Brevena's proprietary purification process, oat beta glucan is transformed into the healing powerhouse known as Macroβ Complex. This technology has been trusted by doctors and plastic surgeons for 20 years to successfully treat traumatized skin in burn center nationwide. The unique, cellular properties make it the ideal formula to calm sensitive skin, replenish severely dry skin and soothe irritation while protecting skin from future damage and environmental age accelerators. 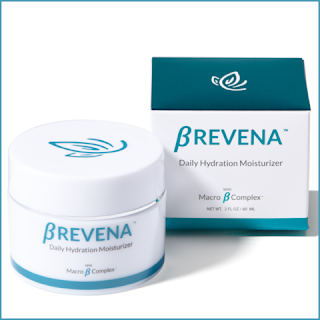 From this discovery Brevena brought the line of skincare products to you with the Macroβ Complex. 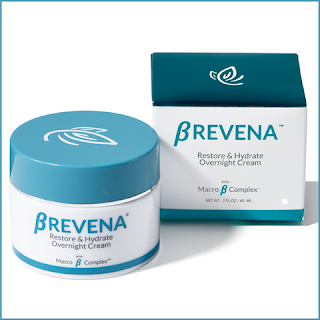 Brevena's Perfect Pair combines two of its best creams: Daily Hydration Moisturizer and Restore & Hydrate Overnight Cream. Both of these are at the heart of the Brevena skincare routine. The Daily Hydration Moisturizer is a perfectly lightweight cream that leaves your skin feeling refreshed and silky smooth with a dewy glow. It improves dryness, minimizes fine lines and wrinkles, brightens and restores luminosity, leaves skin glowing and is ideal to prep skin prior to makeup application. Infused with the Macroβ Complex, to bring your skin back to a healthier state, this formula locks in moisture while visibly plumping and softening skin. It boosts luminosity and bounce too. Protecting skin from everyday stressors and pollution, this whipped cream seals hydration and offers hyaluronic acid and antioxidants for a dewy glow, while blurring the visible signs of aging. This lightweight, daily moisturizer is ideal for all skin types delivering long-lasting hydration and improved elasticity, leaving you with soft, supple skin. Dermatologist tested, fragrance free. Dye-free and made in the USA. This doesn't have a SPF in it though, so wear one under or over it otherwise you are not doing your skin any good. The Restore & Hydrate Overnight Cream is a rich, comforting night cream that nourishes and firms our skin while you sleep. It minimizes fine lines and wrinkles, improves dryness, restores firmness and elasticity and leaves skin replenished and luminous. Age and hormonal changes are known to weaken skin, leaving it dry dull and tight. Dry air, wind, sun exposure, excessive cleansing, low humidity and pollutants can all affect skin's moisture level. 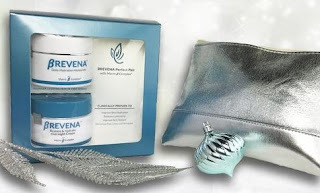 Break the cycle of dry skin with Brevena! This anti-aging moisturizer cocoons skin overnight for a vibrant, youthful, refined texture. Over time, wrinkles appear reduced and skin looks firmer and smoother. This formula, with Macroβ Complex, hyaluronic acid, shea butter and potent antioxidants works to replenish and infuse the skin with moisture for a visibly softer, smoother complexion by morning. Your skin will feel incredible and look refreshed, luminous and supple. Dermatologist tested. Fragrance-free, dye-free, steroid-free. The two products in this kit are full size and usually cost around $79.00 each, so you are saving a nice amount of money purchasing them this way. I highly recommend each cream. They are both very good at what they do. I just wish the day cream had a SPF to it. Both of these creams are good for skin that is sensitive, dry and that needs some TLC. I would not recommend it for skin that is acneic or oily. I would recommend it for mature, dry, normal, combination and sensitive skins. What I like about these cream is that they do indeed give you increased moisture in your skin, which is perfect for winter. Skin in winter tends to become parched and can overproduce oil, causing acne lesions when you don't want it too. So you need to keep it well moisturized so that it doesn't do this. Keep it well moisturized and well hydrated so that your skin doesn't feel the need to step in and do it's own job and try to "fix" things on its own. Brevena Perfect Pari Kit can be found online at www.brevena.com. Like Brevena on Facebook: https://www.facebook.com/brevena; Follow Brevena on Twitter: @brevenaskincare; Follow Brevena on Pinterest: https://www.pinterest.com/Brevena/macro-%CE%B2-complextm/ and Follow Brevena on Instagram: https://www.instagram.com/brevenaskincare/, Subscribe to Brevena on YouTube: https://www.youtube.com/channel/UCsIdFSYaq7yKq80omz4OIEQ.